Many large and medium-sized organizations have made strategic investments in the SAP NetWeaver technology platform as their primary application platform. In fact, SAP software is used to manage many core business processes and data. As a result, it is critical for all organizations to manage the life cycle of user access to the SAP applications while adhering to security and risk compliance requirements. 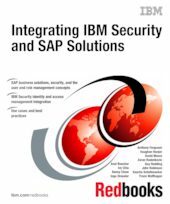 In this IBM® Redbooks® publication, we discuss the integration points into SAP solutions that are supported by the IBM Security access and identity management product capabilities. IBM Security software offers a range of identity management (IdM) adapters and access management components for SAP solutions that are available with IBM Tivoli® Identity Manager, IBM Tivoli Directory Integrator, IBM Tivoli Directory Server, IBM Access Manager for e-business, IBM Tivoli Access Manager for Enterprise Single Sign-On, and IBM Tivoli Federated Identity Manager. This book is a valuable resource for security officers, consultants, administrators, and architects who want to understand and implement an identity management solution for an SAP environment.